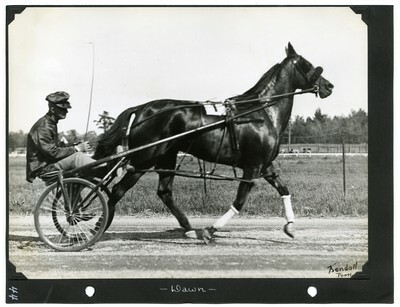 Black and white photo of mare, Dawn, in the backstretch of the Cumberland County Fair Trotting Park at the Western Maine Agricultural Exposition, Gorham, Maine, August 1932. Wearing saddle number one and driven by Smith, Dawn claimed the $100 purse in three heats of the 2.30 pace with a time of 2.14. Kendall's signature appears in India ink in the lower right corner of the photograph.